On October 23, you will have the chance to listen and engage with five companies (Magnes Insurance, St Josephs Hospital, Spear Interactive, Autonomous Vehicle Innovation Network (AVIN) and CNA Insurance) as they present their industry problems to you. If you’re an aspiring entrepreneur or passionate about solving problems, then you will not want to miss out on the opportunity to meet with these companies. They’re also looking to hire students for the upcoming year so another brilliant reason for you to come out! Lastly, we want to provide you with the opportunity to connect with other students in the hopes of you forming a team. So where does the money come in? 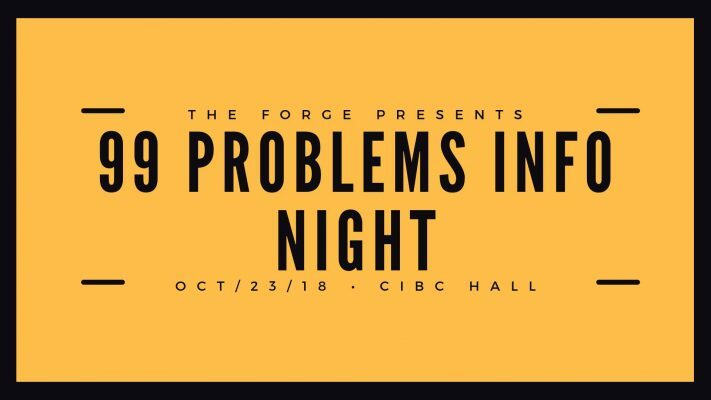 On November 6, the Forge is hosting the “99 Problems Competition” where you can win your share of $3,000! We are looking for students to pitch their solutions to either the problems presented by the companies or you can come forward with your own! By coming out to the event on October 23rd, you’ll receive the inside scoop of the competition. The Forge team hopes to see you there!